Home Island Life Shore Environment In a Nor’Easter, What Constitutes ‘Major’ Coastal Flooding? In a Nor’Easter, What Constitutes ‘Major’ Coastal Flooding? Meteorologists are warning that coastal flooding during a potential nor’easter this coming weekend may range from moderate to major. But what delineates a “major” flooding threat from a “moderate” flooding threat? Some evacuations become necessary during a major flooding event, and “vulnerable homes and businesses may be severely damaged or destroyed.” Often, roads become impassable and some neighborhoods may be isolated. The flood waters become a danger to anyone who attempts to cross on foot or in a vehicle. In terms of storm surge, the NWS is currently predicting this weekend’s nor’easter will bring with it a surge of 2 to 5 feet, a significant event, but far less than the 8.8-foot surge that pummeled New Jersey during Superstorm Sandy. Chris Huch, a Community Resiliency Specialist at the Jacques Cousteau National Estuarine Research Reserve in Tuckerton, said via social media this week that the highest surge recorded in New Jersey was during the Dec. 12, 1992 nor’easter, which reached 9 feet. Sandy’s 8.8-foot surge tied the Sept. 14, 1944 hurricane. Hurricane Gloria, in 1985, and the October 31, 1991 “Halloween Storm” both brought an 8.6 foot surge onshore, while the Ash Wednesday Storm of 1962 tied Hurricane Belle in 1976 with an 8.4 foot surge. 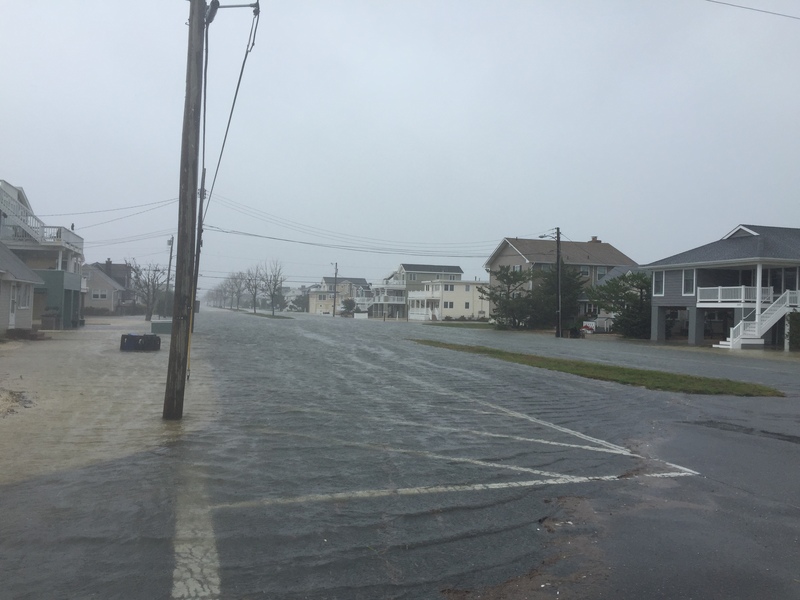 The National Weather Service warned that, while predictions currently call for a 2-5 foot surge, there is the potential for a “major” event that could place a surge within the top five floods in Jersey Shore history. “We’re not yet saying this will happen, but we need to monitor that potential,” forecasters with the Mount Holly office wrote in an advisory late Tuesday.